When inflammation fires and burns out of control, trouble follows. Trouble that could take a toll on the rest of your body. For years, I've told my patients and readers that lowering inflammation is one of the most important things you can do for overall health. The thing is, health problems caused by inflammation don't just happen overnight. They can lie hidden for years until one day the fire becomes too hot and bursts into flame. That's when you start feeling joint aches, muscle tenderness, swelling, and other symptoms. So it makes sense that if you reduce inflammation at its source, not only will you keep your joints flexible and ache-free - your overall health can improve, too. You probably already know that you should stop smoking, drink only in moderation, avoid sugars and processed foods, and cut back on red meat. All those things are like throwing gasoline on inflammatory fires. Instead, eat more green vegetables, legumes, and whole grains. These "cooling foods" help boost your body's production of a natural anti-inflammatory prostaglandin called PGE-1. Stress and lack of sleep can contribute to inflammation flare-ups too. So you should get enough rest and try relaxation techniques like yoga and meditation. A lot of my readers tell me they've tried everything and still have problems. That's why I've recommended herbal supplements that help reduce inflammation. Not only do they help limit inflammation at the source, they're usually safer and kinder on your GI system than conventional remedies. A couple of these natural products do a pretty decent job of easing excessive inflammation. But for the most part they don't contain a truly effective combination in the most effective potency. They use what I call the "dry martini" approach — adding ingredients in such meager quantities that it's little more than "window dressing" on the product label. One leading formula, for example, proudly lists that it contains 10 mg of resveratrol. True, resveratrol does support healthy inflammation response — but not in that tiny amount. Not only that, some formulas contain as much as 10 mg of caffeine. That doesn't sound like a lot, but it's enough to keep you awake at night if you take it close to bedtime. Plus, None of Them Contain a New Discovery That's Essential If You Want Genuine Relief! It's one of the lesser-known herbs in Western medicine — but it's been used by China for thousands of years to help cool down inflammatory fires and promote the healing process. And today, scientists are taking a closer look. 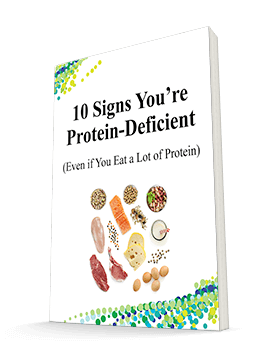 Because new studies confirm it can help limit inflammation overload. Why? Because research shows it can quickly reduce the destructive action of COX-1, COX-2, and the elusive 5-LOX enzyme — the three biggest contributors to inflammatory response in your body. Not only that, it can even help support healthier circulation ... improve blood flow to the brain ... and even protect your stomach and liver from the damage caused by over-the-counter NSAIDS and other remedies. As a result, it helps manage healthy inflammatory responses throughout your entire body. Best of all, this nutrient is safe, fast-acting, inexpensive — and seems to get results for just about everyone who tries it, no matter what their age. What is This Remarkable New Discovery for Managing Inflammation? It's Celery seed. You know it as a spice that's often used in salads. But it's also an abundant source of a compound called 3-n-butylphthalide — or 3-n-B for short. It's the ingredient that gives celery its characteristic flavor and odor. Why is 3-n-B such a powerful inflammation fighter? For one thing, it lowers the levels of uric acid in the bloodstream. Too much uric acid tends to crystallize in the joints. That's when you begin to feel stiffness in fingers, toes, elbows and other joints. What sets off inflammation overrun in the first place? Unhealthy inflammatory response is usually caused by the overproduction of certain "trigger enzymes" in the body. You've probably heard about COX-1 and COX-2. When these enzymes build up, they cause swelling and discomfort, especially in the joints. There are plenty of over-the-counter remedies as well as natural solutions that claim to block both these compounds. I've tried them myself, and most of my patients have, too. While COX inhibitors provide some relief against inflammation, many people find there is little or no relief at all. Why? Because there's a third, hidden inflammatory enzyme in the body that is completely unaffected by COX-inhibiting remedies. It's called 5-lipoxygenase, or 5-LOX for short. Studies show when 5-LOX runs wild, it floods your body with inflammatory chemicals called leukotrienes - chemicals that can be up to 100 times worse than the COX enzymes! 5-LOX is such a sensitive enzyme, in fact, that even just a tiny bit can cause discomfort somewhere in your body. Those flare ups in your back, neck, hips, or muscles? 5-LOX could be the culprit. The good news is there are a handful of cooling herbs and nutrients that limit the action of all these chemicals - especially the elusive 5-LOX enzyme. By taking them in the right forms and right amounts, you can create better support against inflammation overrun. You'll find all 9 of the safest, most effective nutrients I've found that target inflammation in Reduloxin®. Plus, Reduloxin® includes these nutrients at levels up to three times higher than what you'll find in other supplements -and at the same price. Not only that, it's the only product I know of that contains celery seed extract. Studies show this promising new discovery can limit the inflammatory fires and protect and support the health of your joints, blood vessels, heart, brain, and immune system. BOTTOM LINE: Reduloxin® helps you experience more relief. Click here to try Reduloxin® today! Several international studies show that 3-n-B is extremely effective when it comes to calming down the action of the COX-1, COX-2, and 5-LOX pain triggers. In one Australian study of patients with long-term joint discomfort, celery seed helped reduce tenderness and improve flexibility in a remarkable 68% of patients. Plus, researchers at the University of Chicago Medical Center were shocked to find that 3-n-B can also help lower blood pressure and improve overall circulation. Since inflammation overrun can impede blood flow throughout the body, 3-n-B is an important weapon to help cool it down. Another study said that 3-n-B from celery seed can reduce inflammatory response and improve oxygen flow in the brain. 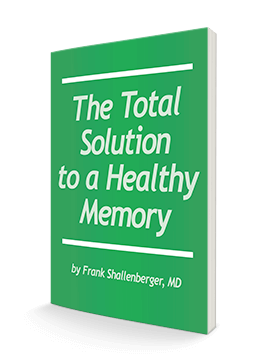 As a result, it can boost memory function, too. So where can you get celery seed? Though it is available in supplements, it's hard to find it in the right levels and the most effective and bioavailable form. That's why I got together with the research team at Advanced Bionutritionals. Together, we created a new, state-of-the-art formula that combines the soothing power of celery seed with 8 more of the safest and most effective nutrients known to help control inflammation. It's called Reduloxin®. And it's specifically designed to cool the inflammatory fires from all directions and on multiple levels ... from easing aching fingers, knees and hips, to giving your heart, brain, and immune system the extra protection they need. What really sets Reduloxin® apart is just how powerfully it works to reduce inflammatory response in your body. For example, each daily dose of Reduloxin® contains 40 mg of celery seed, standardized to 85% 3-n-butylphthalide — the exact form shown in the studies to provide the most cooling power. Nutrient #2: Turmeric. This bright yellow spice has been used as food and medicine dating back to 600 B.C. Turmeric is a powerful antioxidant that fights free radicals that may trigger inflammation in your joints. In fact, one study found that the active ingredient in turmeric protects cells with even greater efficiency than vitamin E, beta carotene or alpha lipoic acid! Plus, I made sure to require the best form of turmeric, called Meriva®. The Meriva form is significantly easier to absorb than normal turmeric, making it work much more effectively than the typical turmeric. Next, I added another best partner for inflammatory response. It's a popular herb that has been shown to reduce inflammation and prevent oxidation. But did you also know it contains a whopping 51 polynutrients that promote healthy inflammatory response? Nutrient #3: Green Tea. Of all the "cooling" compounds in green tea, the most important is a compound called EGCG. According to researchers at the University of Michigan, EGCG helps block the production of prostaglandins that trigger inflammation and joint tenderness. Since Green Tea is so effective for cooling inflammatory fires, I included 200 mg of this vital food. That's two times more than most other supplements. Nutrient #4: Rosemary. This common kitchen herb is rich in caffeic acid and rosemarinic acid, two compounds that reduce leukotrienes produced by the 5-LOX enzyme. Reduloxin® includes an impressive 200 mg of rosemary — 30% more than most other supplements. 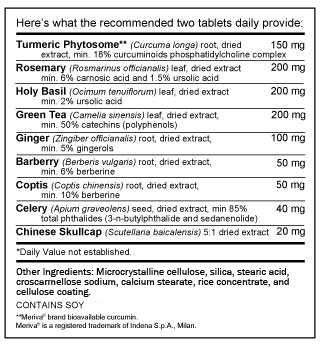 Nutrient #7: Chinese Skullcap Root. This simple root has been used for centuries in Traditional Chinese Medicine to relieve joint aches and inflammation. Today, we know it's an important source of baicalein and wogonin, two very powerful flavonoids that promote a healthy response to inflammation. Chinese skullcap also has another benefit: it's excellent for promoting a good night's rest. Reduloxin® contains 20 mg of skullcap, the level you need to get the most benefit. Other ingredients: Microcrystalline cellulose, silica, stearic acid, croscarmellose sodium, calcium stearate, rice concentrate and cellulose coating. **Meriva® brand bioavailable curcumin. Meriva® is a registered trademark of Indena S.p.A., Milan. Nutrients # 8 and #9: Barberry and Chinese Goldthread (Coptis chinensis). These herbs are both rich natural sources of a phytonutrient called berberine. Not only does berberine inhibit COX-2,5 but it also calms down inflammation in the digestive tract. Reduloxin® contains 50mg each of both Barberry and Chinese Goldthread (Coptis chinensis). That's nearly 50% more than what you'll find in other inflammation-blocking formulas. Reduloxin® is formulated in a way that nature intended. Its goal is to work with your body, using 9 of the best herbs and nutrients in an exclusive combination that's designed to lower inflammation throughout your body. This is the way a natural, healthy inflammatory response is meant to be. Safe. Gentle on your stomach. Powerful and effective. And you don't have to worry about adverse side effects, either. When you can get this much power in one simple capsule, it becomes so much easier to protect your heart, your joints, your brain, your digestive system and your immune health from the dangers of inflammatory overload. That's why I urge you to give Reduloxin® a try. If you purchased these 9 nutrients separately — if you can even find them — you'd spend $180 or more for a one month supply. And you'd have no guarantee you'd get these extracts in the right combinations or in the standardized forms. 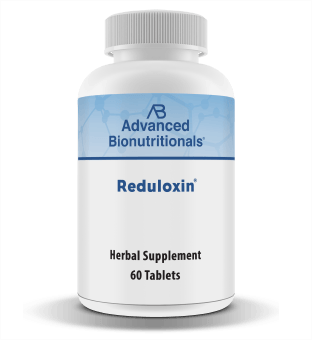 Plus, Reduloxin® delivers more of the active ingredients and two to three times the inflammation-fighting power of other supplements. And it provides it to you at the same price as other inflammation response supplements, too. If you want the best deal plus the lowest price per bottle, then go with our Six-month plan. Order a six-month supply of Reduloxin® and you'll save 27% on each bottle — plus, get free shipping. You pay only $98.70. That's a total savings of $27.95! Click here to save 27% with our Best Deal and order Reduloxin® today! Plus, you have nothing to lose with my Down-to-the-Last Pill Guarantee! That's right — as with every Advanced Bionutritionals product you're completely protected by our "down-to-the-last-pill" guarantee. If you're not 100% satisfied with Reduloxin® at any time, simply send back the empty bottle to us within 90 days of your purchase. We'll refund every penny you paid — including shipping and handling! You only pay return shipping. Click here to try this amazing breakthrough in supporting healthy inflammation response today! Or, just call us toll-free at 1-800-791-3395 to have Reduloxin® rushed right to your door. Our health consultants are available to help you 24 hours a day, seven days a week. Remember, when you fight inflammation, your overall health improves, too. Reduloxin® targets the 3 major triggers of inflammation: COX-1, COX-2, and 5-LOX ... limits joint swelling and discomfort ... and helps you enjoy life, active and worry-free. So please get started today. In just a few short weeks — and in the years to come — you'll be so glad you did. PS: Not only does Reduloxin® give you the best form of turmeric, making it work harder than the turmeric in other formulas, it's the only one to harness the soothing power of celery seed to cool inflammation in the rest of your body too. That's why Reduloxin® is the only natural solution for healthy inflammatory response I take and recommend. ACT NOW! Order Your Reduloxin® Today!